So this post is all about sustainable and natural bamboo sanitary pads, period. I've stumbled upon an amazing product that's worth looking into...featuring the Tsuno range. Tsuno offers a range of disposable, sustainable bamboo fibre sanitary pads which are very eco-friendly. There are no nasties being chlorine or bleach and it's wrapped in biodegradable plastic too. 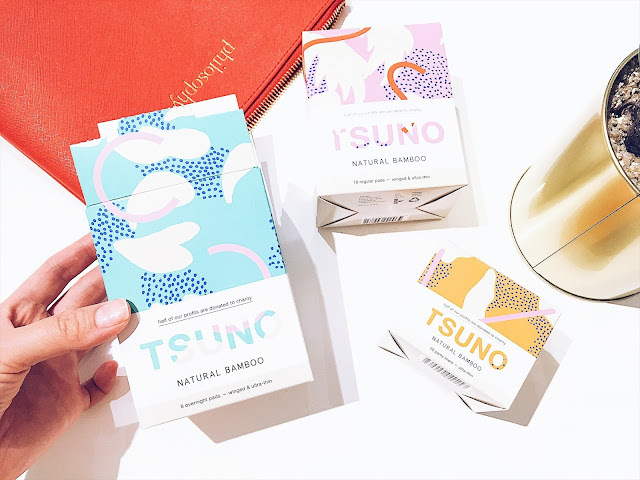 Not only do their products come from natural sources but Tsuno are a social enterprise where 50% of their profits are donated to charities that focus on empowering women with their main focus being education and menstrual support. Currently Tsuno is partnering with One Girl where they provide education scholarships and sanitary pads to marginalised girls in Sierra Leone and Uganda. Essentially the Tsuno sanitary pads are made from natural bamboo (no harsh chemicals have been used to process it) as well as corn fibre top sheet that's individually wrapped in biodegradable packaging. The pads are packed in recyclable cardboard boxes which have a groovy patterns and definitely lots of colour. The pads are very breathable, absorbent, soft and comfortable as well as being antibacterial. Tsuno are also currently researching to develop a 100% biodegradable product and the bottom layer is a breathable polyethylene film which ensures that the pad stays leak proof and works to do the job for you. However, Tsuno will look to find a suitable alternative biodegradable material in the near future. As for the overall packaging of the Tsuno sanitary pads, they feature different editions of different artist's work including Erin Lightfoot, Tim Royall, Evi O, Eloise Rapp and Andrea Shaw. What are your thoughts on the Tsuno range? Thank you Tsuno for supporting me for this review. My reviews are based on my own experiences and I only recommend products that I truly believe in.